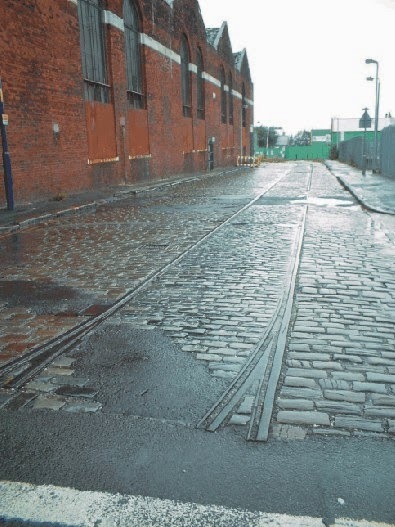 With Britain's new generation of tramways now well established, here are a handful of reminders of Britain's 'first generation' of tramways. Rednal, Birmingham. 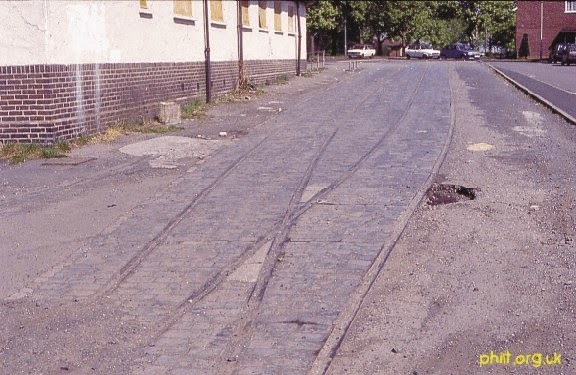 Once the terminus for trams on route 70 from the City Centre, this section of track and pointwork survives. Rednal was an extremely busy terminus on high days and holidays as thousands of people headed for a day out in the Lickey Hills. An intensive service was operated on such occasions, with trams drafted in from several depots. The route to Rednal, along with other Bristol Road services, was withdrawn on 6th July 1952. Edmund Street, Birmingham. 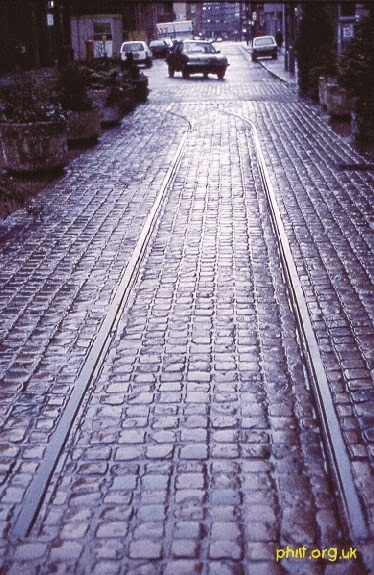 A short section of rail which has been relaid near to its original position in Birmingham City Centre. 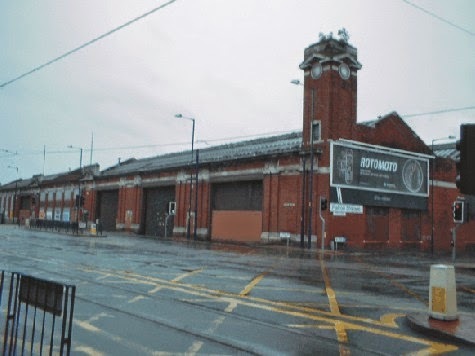 From here, trams ran in the direction of Lodge Road and Ladywood. Birmingham ran an extensive 3ft 6ins gauge system, with over 500 cars operating from eleven depots. Routes were closed from 1947 onwards with the last routes to Short Heath, Pype Hayes and Erdington ceasing on 4th July 1953. The last car was no. 616, but the only complete surviving car is no. 395 now housed at Birmingham 'ThinkTank' (They used to be called museums...). Piccadilly, Manchester. 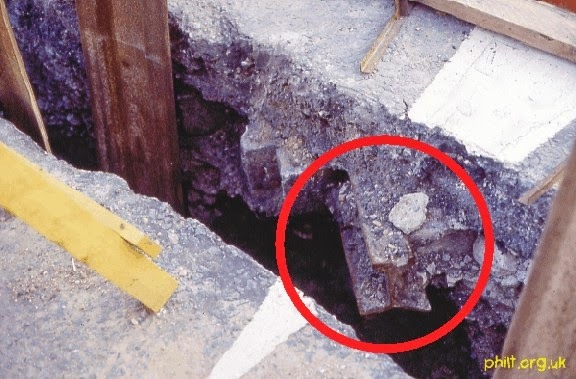 When work was under way to construct the new Metrolink network in Manchester, roadworks in Piccadilly uncovered several sections of rail from the city's previous tramway network, as shown here. 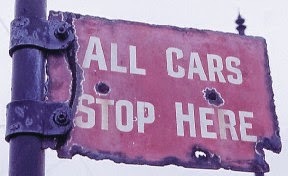 Manchester's network once boasted 1000 cars at its peak and the system closed on 10th January 1949. Happily, that was not the end of the story as the first Metrolink public services commenced in April 1992. 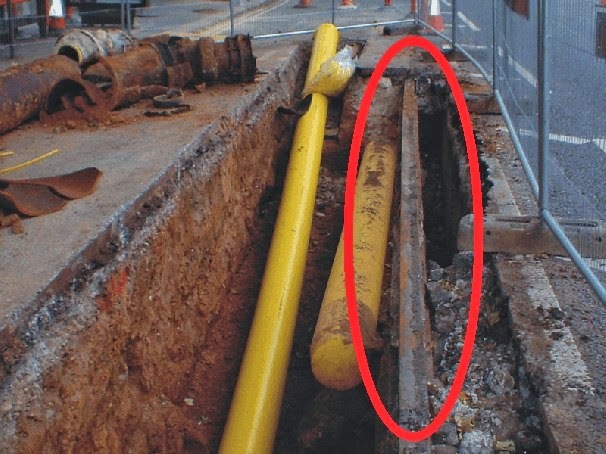 (Construction of the new NET tramway in Nottingham also uncovered sections of first generation tram rail.). Kingsway Subway, Holborn, London. The Kingsway tram subway was opened in 1908 to link the services of North London to those of South London which passed over Westminster Bridge. The subway had two stations at Holborn and Aldwych which were reached by stairs from the street.The original tunnel was built to carry single deck cars, but in 1930 the tunnel was enlarged to enable double-deck cars to be used. The trams picked up their electricity supply through a conduit laid in a groove between the running rails, which was the common practice within Central London where there were sensitivities about the aesthetics of overhead wiring. Trams last ran through the subway on the 5th July 1952 and part of the tunnel was subsequently used as a flood control centre for London. (A flood control centre - in a tunnel?). Kingsway Subway, London. 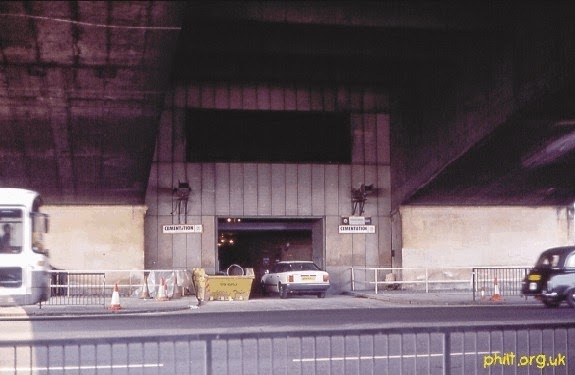 Some activity at the remains of the Southern portal of the tunnel, from Victoria Embankment under Waterloo Bridge, seen on 27th April 1991. All there is to see normally is a locked metal door and a narrow driveway in front of it. More about Kingsway Tramway subway here. Midland Road, Derby. 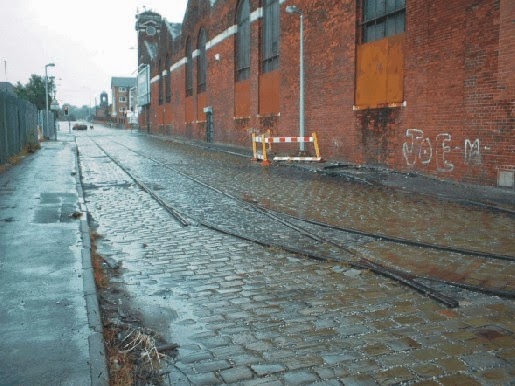 Another example of roadworks exposing a long-forgotten section of tram rail. Derby's trams ran on a 4ft 0in gauge system which closed on 2nd July 1934. At its maximum, the fleet comprised 78 cars, of which no.1 is preserved as a static exhibit at Crich. Photo taken 20th June 2004. Bath. 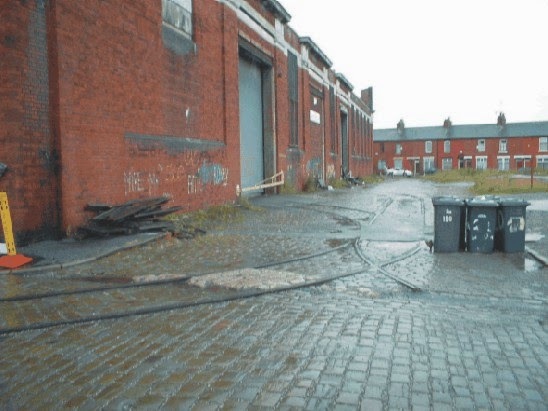 The former eight-road tram depot just off Walcot Street near the City Centre still remains in good order. 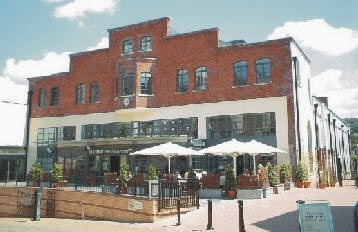 Nowadays the building serves as a bar-restaurant with an appropriately named annexe (left) called 'The Tramshed'. Bath's trams - the fleet once numbered about 40 - were replaced by buses on 6th May 1939.